We have some gorgeous new fabrics from Kaffe Fassett! His saturated, multi-color designs are truly one of a kind. These woven stripe cottons are rich in color with a soft texture. Equally at home in shirts or quilts! These cotton prints from Kaffe are huge in scale, featuring elements from nature amped up with extra color! Today's Treadlette Tuesday features our newest Treadlette, Olivia! "I started sewing when I was 9. My grandma and my mom taught me. I always preferred to sew with my grandma because I didn't like listening to my mom at that age. She would help me with my projects for 4H." 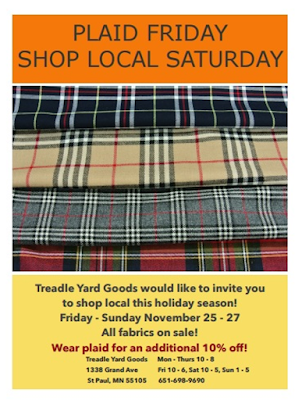 "I have worked at Treadle for about a year and a half but I've frequented Treadle since I was a baby with my mom! I have fond memories hanging out in the store, playing with the toys, organizing buttons and straightening ribbon." "I haven't tried a wide range of projects yet so I'm not sure what my favorite thing to sew is just yet. My favorite fabric to wear is knit because it's comfortable but can still look cute and put together. I also love the drape and feel of rayon but hate that it wrinkles and shrinks!" "My most recent projects haven't been anything too exciting. I've hemmed pants and made little burp cloths for friends having babies. My favorite project was a shirt that made for 4-H one year in middle school. It was black with white polka dots in a peasant top with red buttons. I won a blue ribbon on it and felt very proud. Sometimes I still wish I had that shirt and that it fit me!" 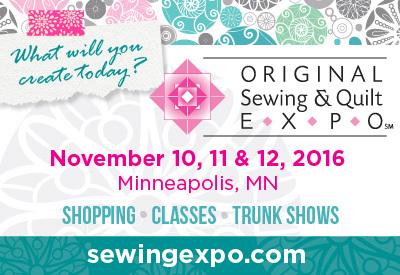 Visit Treadle Yard Goods November 10, 11, & 12 at the Original Sewing and Quilt Expo! Located at the DoubleTree Bloomington, the Expo offers a wide array of classes, lectures, and workshops on diverse sewing topics! Enjoy a runway fashion show and view breathtaking quilts on display. Plus, visit the vendor area where Treadle's booth will have a variety of totally NEW, exclusive fashion fabrics available for sale! It's 3 days of sewing fun, starting TODAY! This week's Treadlette is Julia! Hi Julia! "I started sewing with our family friend Suzy Sewell when I was in fifth or sixth grade. When I was in seventh grade I joined 4H and began a more formal study: reading patterns and having garments 'graded' at county events." Like most of our Treadlettes, she's been with us a while! "I started at Treadle in 1986, left in 1987, then returned in 1998." Project-wise, it seems like Julia always has something cooking! "I like to sew gifts for other people: pillowcases, camp shirts for my husband, and last year stuffed dogs for my family." Julia also makes great dresses. We've had several of her projects displayed in the store recently, like this cute chambray double gauze dress. "I'm a bit late to the 'sewing with knits' party, but am enjoying trying to find the perfect t shirt pattern. I really enjoy a soft knit, especially cotton! "My most recent project is a t shirt pattern that can also be lengthened to a dress. When it fits correctly as a top, I look forward to making both the dress and many iterations of both!" We look forward to seeing it. Thanks, Julia! Sewing isn't just about the fun, flashy fabrics. Sometimes you need plainer fabrics to help support your stars, especially with formal and bridal sewing. We've put together a group of essential dressmaking fabrics to share with you. They may not be the most exciting on their own, but they'll lend an invaluable hand to your sewing! First up, a soft, draping, sheer white net. This is a gorgeous alternative to traditional bridal veiling. It would also give soft support as a petticoat under formal dresses. This soft cotton bobbinette is a rich creamy ivory color and another perfect veiling material. It would also be a gorgeous base for traditional embroidery to give a needlepoint lace effect. Our new cotton organdy is semi-sheer and paper-crisp. Use it for rustling petticoat ruffles and interfacing hems on silk. Our new nylon crinoline is super sheer and so stiff you could practically build a ship with it! Use for supporting the fullest ballgown skirts and the heaviest bridal satin. Horsehair braid in various widths is a crisp hem essential. When you need a structured edge, horsehair braid is the answer. The wider widths have a small cord woven in; to shape the braid around a curved hem, simply pull the cord to draw in one edge! This soft dotted netting is another lovely alternative to traditional tulle veiling. The dotted net is also available in black! Don't overlook these dressmaking essentials. 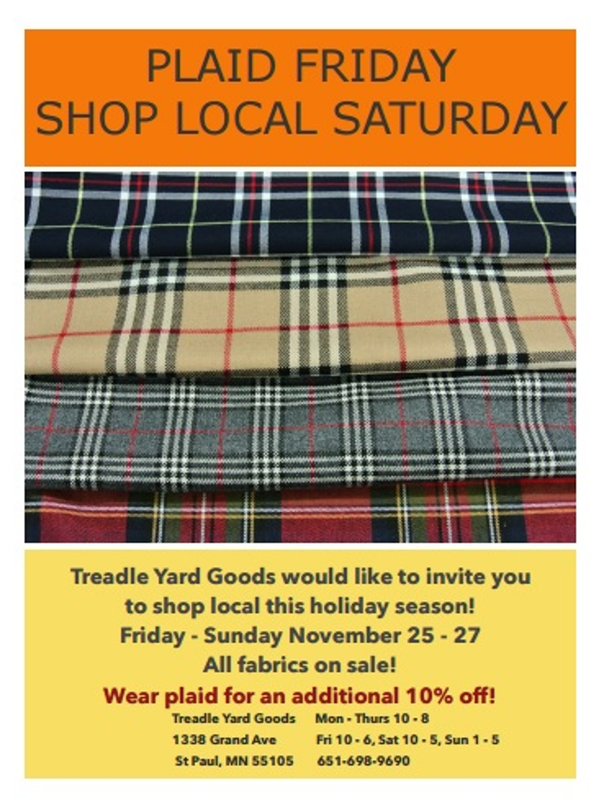 Treadle Yard Goods has you covered! Everyone loves wearing knits! With colorful, creative prints like these, you can have a fun fabric AND comfy, easy knit styling! Knits are great for gift sewing since you don't need to fit them as precisely as wovens. Shirts, dresses, pajamas, and lounge pants (for kids and adults!) are perfect in cotton knit. Today let's chat with longtime Treadlette Anne! Anne started at Treadle in 1979, making her one of our longest-running Treadlettes. Anne started sewing way back in 7th grade Home Ec. She made a gingham apron and a dress. "But I wasn't defeated yet," she says. Her mother also sewed and they spent long sewing weekends up North working on projects. Sounds like bliss to me! Anne spent years enjoying sewing from designer patterns such as Calvin Klein, Perry Ellis, Adri, and Issey Miyake. "Their simple styles appealed to me and I made them up in linens and cottons. I still use these patterns once in a while. "But I have become very fond of quilting - I love putting color and pattern together! It's a lot like jigsaw puzzles - my very favorite pastime!" Anne made this fabulous quilt a few years ago from a Tula Pink fabric bundle. Her beautifully precise construction really set off these zingy bright fabrics! Anne also loves making Christmas stockings. "They range from elegant pieced styles with lace and tassels to very silly felt stockings for my special canine and feline buddies." One of Anne's favorite techniques is bias bindings. "I love making bias bindings. I've even gone so far as to convince co-workers that their projects needs this extra touch just so I could make it for them!" Current projects? "I'm working on a pieced table runner. I had intended to use only what I had in my stash, but you all know how that goes." Recently Anne moved to a town a bit father away from Treadle, so she isn't working with us as often. But you'll still see her on the occasional weekend! Be sure to say hi! You can read previous posts in our Get To Know Us series here! And look for more every Treadlette Tuesday!